The LiBr-H2O system operates at a generator temperature in the range of 70-95°C, with water used as a coolant in the absorber and condenser, and has a COP higher than the NH3-H2O systems. The COP of this system is between 0.6 and 0.8. A disadvantage of the LiBr-H2O systems is that their evaporator cannot operate at temperatures much below 5°C, since the refrigerant is water vapor. Commercially available absorption chillers for air-conditioning applications usually operate with a solution of lithium bromide in water and use steam or hot water as the heat source. Two types of chillers are available on the market: the single effect and the double effect. The single-effect absorption chiller is used mainly for building cooling loads, where chilled water is required at 6-7°C. The COP will vary to a small extent with the heat source and the cooling water temperatures. Single effect chillers can operate with hot water temperature ranging from about 70-150°C when water is pressurized (Florides et al., 2003). The double-effect absorption chiller has two stages of generation to separate the refrigerant from the absorbent. Therefore, the temperature of the heat source needed to drive the high-stage generator is essentially higher than that needed for the single-effect machine and is in the range of 155-205°C. Double-effect chillers have a higher COP of about 0.9-1.2 (Dorgan et al., 1995). Although double-effect chillers are more efficient than the single-effect machines, they are obviously more expensive to purchase. However, every individual application must be considered on its own merits, since the resulting savings in capital cost of the single-effect units can largely offset the extra capital cost of the double-effect chiller. The Carrier Corporation pioneered lithium-bromide absorption chiller technology in the United States, with early single-effect machines introduced around 1945. Due to the success of the product, soon other companies joined in production. The absorption business thrived until 1975. Then, the generally held belief that natural gas supplies were lessening led to U.S. government regulations prohibiting the use of gas in new constructions and, together with the low cost of electricity, led to the declination of the absorption refrigeration market (Keith, 1995). Today the major factor in the decision on the type of system to install for a particular application is the economic trade-off between different cooling technologies. Absorption chillers typically cost less to operate, but they cost more to purchase than vapor compression units. The payback period depends strongly on the relative cost of fuel and electricity, assuming that the operating cost for the needed heat is less than the operating cost for electricity. The technology was exported to Japan from the United States early in the 1960s, and Japanese manufacturers set a research and development program to further improve the absorption systems. The program led to the introduction of the direct-fired double-effect machines with improved thermal performance. Today gas-fired absorption chillers deliver 50% of the commercial space-cooling load worldwide but less than 5% in the United States, where electricity-driven vapor compression machines carry the majority of the load (Keith, 1995). Many researchers have developed solar-assisted absorption refrigeration sys-terns. Most of them have been produced as experimental units, and computer codes were written to simulate the systems. Some of these designs are presented here. 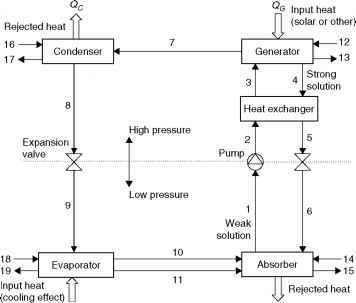 Hammad and Audi (1992) described the performance of a non-storage, continuous, solar-operated absorption refrigeration cycle. The maximum ideal coefficient of performance of the system was determined to be equal to 1.6, while the peak actual coefficient of performance was determined to be equal to 0.55. Haim et al. (1992) performed a simulation and analysis of two open cycle absorption systems. Both systems comprise a closed absorber and evaporator, as in conventional single-stage chillers. The open part of the cycle is the regenerator, used to re-concentrate the absorber solution by means of solar energy. The analysis was performed with a computer code developed for modular simulation of absorption systems under varying cycle configurations (open and closed cycle systems) and with different working fluids. Based on the specified design features, the code calculates the operating parameters in each system. Results indicate that there is a definite performance advantage of the direct regeneration system over the indirect one. Hawlader et al. (1993) developed a lithium bromide absorption cooling system employing an 11 X 11 m collector-regenerator unit. They also developed a computer model, which they validated against real experimental values with good agreement. The experimental results showed a regeneration efficiency varying between 38% and 67% and the corresponding cooling capacities ranged from 31-72 kW. Ghaddar et al. (1997) presented the modeling and simulation of a solar absorption system for Beirut. The results showed that each ton of refrigeration requires a minimum collector area of 23.3 m2 with an optimum water storage capacity ranging from 1000-1500 L for the system to operate solely on solar energy for about 7 h/d. The monthly solar fraction of total energy use in cooling is determined as a function of solar collector area and storage tank capacity. The economic analysis performed showed that the solar cooling system is marginally competitive only when it is combined with domestic water heating. Erhard and Hahne (1997) simulated and tested a solar-powered absorption cooling machine. The main part of the device is an absorber-desorber unit, which is mounted inside a concentrating solar collector. Results obtained from field tests are discussed and compared with the results obtained from a simulation program developed for this purpose. Hammad and Zurigat (1998) describe the performance of a 1.5 ton solar cooling unit. The unit comprises a 14 m2 flat-plate solar collector system and five shell and tube heat exchangers. The unit was tested in April and May in Jordan. The maximum value obtained for actual coefficient of performance was 0.85. Zinian and Ning (1999) describe a solar absorption air-conditioning system that uses an array of 2160 evacuated tubular collectors of total aperture area of 540 m2 and a LiBr absorption chiller. Thermal efficiencies of the collector array are 40% for space cooling, 35% for space heating, and 50% for domestic water heating. It was found that the cooling efficiency of the entire system is around 20%. Finally, Ameel et al. (1995) give performance predictions of alternative low-cost absorbents for open cycle absorption using a number of absorbents. The most promising of the absorbents considered was a mixture of two elements, lithium chloride and zinc chloride. The estimated capacities per unit absorber area were 50-70% less than those of lithium bromide systems. A new family of ICPC designs developed by Winston et al. (1999) allows a simple manufacturing approach to be used and solves many of the operational problems of previous ICPC designs. A low concentration ratio that requires no tracking is used with an off-the-shelf, 20 ton, double-effect, LiBr, direct-fired absorption chiller, modified to work with hot water. The new ICPC design and double-effect chiller were able to produce cooling energy for the building using a collector field that was about half the size of that required for a more conventional collector and chiller. A method to design, construct, and evaluate the performance of a single-stage lithium bromide-water absorption machine is presented by Florides et al. (2003). FiGURE 6.23 schematic diagram of an absorption refrigeration system. In this work, the necessary heat and mass transfer relations and appropriate equations describing the properties of the working fluids are specified. Information on designing the heat exchangers of the LiBr-water absorption unit is also presented. Single-pass, vertical tube heat exchangers have been used for the absorber and the evaporator. The solution heat exchanger was designed as a single-pass annulus heat exchanger. The condenser and the generator were designed using horizontal tube heat exchangers. Another valuable source of LiBr-water system properties is with the program EES (Engineering Equation Solver), which can also be used to solve the equations required to design such a system (Klein, 1992). If power generation efficiency is considered, the thermodynamic efficiency of absorption cooling is very similar to that of the electrically driven compression refrigeration system. The benefits of the solar systems, however, are very obvious when environmental pollution is considered. This is accounted for by the total equivalent warming impact (TEWI) of the system. As proven by Florides et al. (2002c) in a study of domestic size systems, the TEWI of the absorption system was 1.2 times smaller than that of the conventional system. How hot water absorption chiller works? How work chiller with two stage compressor? How the hot water system works? How gas fired refrigeration works? How a chiller works diagram? How lithium bromide chiller work? How water chiller system works diagram? How does a water chiller system function? How chiller system works drawing? How does a chiller work diagram? How does a refrigerator works? How chiller condenser pump works? How does a well water system work?